Your heart is a wondrous part of your body wisdom as it pumps for a lifetime, constantly adjusting flow dynamics to meet the needs of the moment. Consequently chest pain, angina, or heart attack often not occur until the blockage is 80% or greater and then people are swept into the ER where Cardiologists perform angiograms and then stents, angioplasties and cardiac bypass procedures, all of which are symptom relieving and do not address the cause of coronary blockage. 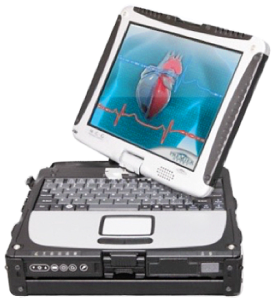 MCG is capable of accurately detecting coronary artery disease at earlier stages (<70% lumen encroachment), exceeding the capabilities of many other techniques and allowing earlier intervention at stages where coronary artery disease may be controlled by lifestyle changes or medication. . MCG will also show the decreasing coronary blockage over time with proper nutritional and lifestyle therapy. OBJECTIVES: The aim of this study was to evaluate the accuracy of the Multifunction CardioGram (MCG) in detecting the presence of functionally significant coronary ischaemia. METHODS AND RESULTS: This prospective study evaluated the accuracy of the MCG, a new ECG analysis device used to diagnose ischaemic coronary artery disease (CAD). A consecutive 112 participants suspected to have CAD who were scheduled for elective coronary angiography (CAG) from October 2012 to December 2013 were examined. Their predictive values of relevant ischaemia were measured by MCG, standard ECG and Framingham Risk Score (FRS) and compared. Five levels of ischaemia based on CAG findings adjusted by fractional flow reserve (FFR) values and three levels of MCG score of high, borderline or low were used. The MCG (OR=2.67 (1.60 to 4.44), p<0.001) was the only test significantly associated with ischaemia level. The FFR values for individual MCG scores with low, borderline and high were 0.77 (0.70 to 0.86), 0.78 (0.71 to 0.82) and 0.69 (0.65 to 0.77), respectively, p=0.042. A high MCG score had a specificity of 90.4% (87.0% to 93.9%) in model 1 adjusted by FFR≤0.8 threshold and of 87.0% (83.2% to 90.8%) in model 2 adjusted by FFR≤0.75 threshold, and a negative predictive value of 82.5% (78.3% to 86.7%) in model 1 and of 83.8% (79.6% to 87.9%) in model 2 for the prediction of severe ischaemia.